Cycle the dramatic coastline and rugged interior of Cilento National Park. See Greek temples at Paestum and sample local delicacies including mozzarella di bufala and Cilento wines. After five days riding, we discover the dramatic beauty of the Amalfi Coast on the 'Walk of the Gods'. Arriving at Naples Airport we drive for around 2.5 hours to our hotel in San Severino, a small village located in Cilento National Park at the foot of Monte Bulgheria. Still largely off the tourist radar Cilento NP is the second largest in Italy and its isolated location has left the beautiful countryside unspoilt and local traditions preserved. Over the next few days we will explore by bike the rugged coastline and pine-forested mountainous interior dotted with historic villages. There will be time for an introductory briefing either before or after we settle into our rooms. The hotel kitchen will most likely have closed by the time we arrive, but the Tour Leader will be able to pre-arrange some food for those interested before arriving. After breakfast we spend some time getting comfortable with our bikes and making any necessary adjustments. The first ride starts off by heading around the foot of Mt. Bulgheria, towards the village of San Giovanni a Piro. We then climb up to the grassy plateau of Ciolandrea where we gain terrific coastal views looking south. A very scenic downhill section then leads us to picturesque fishing village of Marina di Camerota. After a break for ice cream we cycle inland again, climbing up to Camerota village. Known locally for terracotta and 'libano' rope, we learn more about the ancient local art of braiding to make this rope that still continues to this day. The final part of today's ride is along the Mingardo river canyon back to San Severino. Please note that there is the option to ride in a support vehicle today for 6km of the climb, thus avoiding 300 m of ascent from Marina di Camerota to Camerota. Our total cycling distance today is approximately 54 kilometres (1100 metres total accumulated ascent and descent). Today we leave San Severino behind and ride north through this land of myth and legend. Our route leads us firstly to the coastal village of Palinuro, named after the helmsman of Virgil's Aeneid who fell overboard. We continue along the jagged coastline to the medieval village of Pisciotta, picturesquely situated with commanding views along the coast. The tiny port of Marina di Pisciotta has kept centuries-old fishing techniques alive, using the moon and the stars to determine where the anchovies will surface. We plan to break here for lunch before continuing along the coastal road past olive groves and Mediterranean macchia or shrubland. In Ascea we will stop to learn about another traditional local delicacy - dried white figs. Their protected DOP status is thanks to an especially sweet flesh and fine seeds. Finally we descend to the tranquil coastal village of Marina di Ascea and our hotel where we spend the next two nights. Our total cycling distance today is approximately 40 kilometres (700 metres total accumulated ascent and 800 metres descent). We start the day firstly riding uphill along the slopes of Monte Stella past vineyards and olive groves to reach Pollica village. From here the undulating road passes inland through chestnut forests and wide-open areas with superb views over the surrounding mountains and the bay below. We pass through a number of charming villages and will no doubt stop in one or two for a rest, lunch and perhaps a coffee. The last part of the ride descends to the coastal plains where we find the archaeological site of Velia. The ancient ruins of the Hellenistic town of Elea, founded in 540 BC, are much less intact than Paestum and this port town was once home to one of the Eleatic school of philosophy. We have included the entrance ticket but for those who prefer to relax at the hotel it is short ride back. Our total cycling distance today is approximately 48 kilometres (720 metres total accumulated ascent and descent). 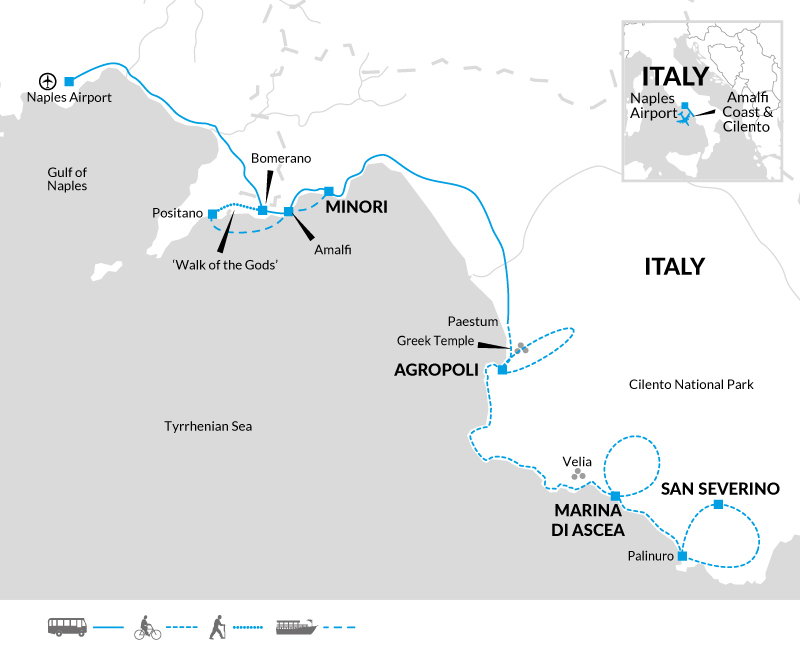 We leave Marina di Ascea this morning and continue our cycle journey north following the coast to Agropoli. We pass through the small fishing village of Pioppi and later visit Acciaroli - a favourite of Ernest Hemmingway who came here in 1952 after he'd completed "The Old Man and the Sea", passing time in the café-bars along the seafront promenade. Later we ride along Punta Licosa peninsula through more Mediterranean shrub lands and often on gravel tracks, where we end up at a local vineyard to learn about local wine production and to sample some wines. The local grapes of Fiano (white) and Aglianico (red) were originally introduced by the Greeks and are still used today to produce some of the excellent Cilento wines. Finally we cycle around Punta Tresino to reach our final stop, and base for the next two nights, in Agropoli overlooking the Gulf of Salerno. Our total cycling distance today is approximately 60 kilometres (850 metres total accumulated ascent and 780 metres descent). After breakfast this morning we start our final cycle ride. We cycle north from Agropoli through a slightly more built up environment now that we are outside of the National Park and after 12 kilometres we reach Paestum. Ancient Paestum (originally founded as Poseidonia in the 7th century BC) boasts some of the best-preserved Greek temples in Europe and we have planned a guided visit to make the most of this wonderful UNESCO site and museum. It was colonised by the Romans in 273 BC but later abandoned for centuries, which helped its preservation, and rediscovered in the 1740 amid thick forest, after which it was firmly established on the Grand Tour and writers, poets and artists from Goethe to Shelley flocked here for inspiration. Highlights include the 'Diver Tomb' fresco - a rare example of Greek funeral painting. After our visit we cycle south back through the Piana del Sele - a vast plain south of Salerno where most of the region's buffalo graze. We will stop at a local mozzarella di bufala farm to learn about the cheese and have a taste before cycling back to the hotel. The afternoon is left free for you to explore the old town of Agropoli, relax on the beach or cycle into the hills for an optional self-guided loop ride (25km, +/-500m). 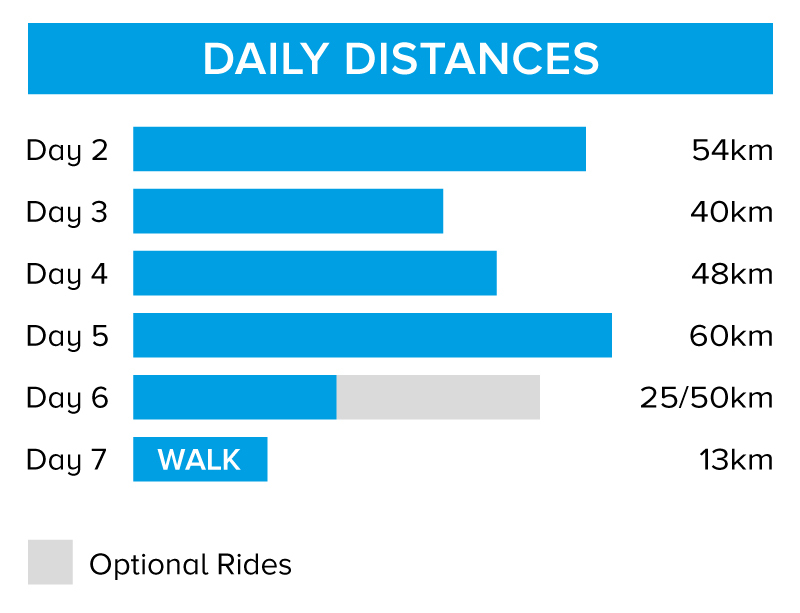 Our total cycling distance today is approximately 25 kilometres (150 metres total accumulated ascent and descent) with a further optional 25 km. Leaving Agropoli after breakfast we drive 2 hours north and along the stunningly beautiful Amalfi Coast corniche road to Bomerano (thankful you aren't cycling considering the traffic here!). The Walk of the Gods is justifiably regarded as one of the greatest coastal walks in the world. We follow the high path from Bomerano as it contours west, under huge limestone cliffs with magnificent panoramas. From the village of Nocelle we descend an ancient stairway into Positano. A poor fishing village until the 1950s, Positano has grown into a chic town and understandably a tourist hot spot. There is time to explore and have a swim before catching the public ferry back to Amalfi, allowing us to appreciate the natural beauty of the Amalfi Coast from the water. The stunning harbour town of Amalfi reached its pinnacle during the Middle Ages, when it vied with Venice, Pisa and Genoa as an one of Italy's great Maritime Republics. You may choose to look around the impressive Duomo di Sant Andrea (St Andrew's cathedral), with its remarkable bronze doors and baroque interior dating back to the 11th century. The beautifully restored ancient Roman basilica is another highlight. Finally we continue by boat the short distance to Minori where we spend our final evening. Today you can spend the day at leisure or take part in an optional visit to the historic town of Ravello. This tranquil spot, located high on a rocky promontory overlooking azure waters, has attracted musicians, artists and writers to its enchanting streets for generations. Later this afternoon we transfer back to Naples Airport, where the trip ends. On this tour we cycle 227 km over five days (an average of 45 km per day). We generally cycle on quiet tarmac roads in good condition and there are some gravel sections on day 4. Some ascents are quite long but gradual in inclination. The tour leader leads the rides and a support vehicle is available for the ascent to Camerota on day 2. We have graded the route as moderate. Your included bike is a 27 gear Atala Planet mountain bike with front suspension and will be the correct frame size for your height. Female and male frames are allocated accordingly when booking unless you specifically request otherwise. A rear pannier bag and water bottle holder is included as well as the facility to fit your own pedals or saddle if you wish to bring them. The tour leader leads the rides and luggage is transported between hotels. We provide spare parts and take care of the day to day maintenance. All you need to bring is your own helmet.